BLOWN GLASS: The oldest and most traditional technique for working with glass is glassblowing. This involves heating glass in a furnace, gathering some molten glass on the end of a blowpipe and blowing a bubble of glass. Glassblowing can result in something as simple as a Christmas tree ornament or as complex as a masterpiece by Lino Tagliapietra. 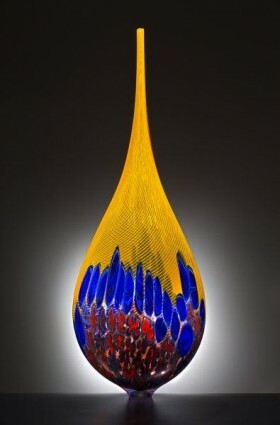 A few of the most prominent artists who use glassblowing as their primary technique are Dale Chihuly, Dan Dailey, Marvin Lipofsky, Dante Marioni,William Morris and Lino Tagliapietra. CAST GLASS: Casting glass involves melting glass in a furnace and pouring it into a prefabricated form. Molten glass can be poured into sand, a clay or plaster mold, etc. Molds are sometimes used also in glassblowing, especially in production pieces. A few prominent glass artists who use glass casting as their primary techniques are Alex Bernstein, Daniel Clayman, Robin Grebe, Charles Miner and Steven Weinberg. COLD GLASS: (also called FABRICATED GLASS): Cold glass working, to state the obvious, does not involve heat. A glass artist using cold glass techniques might laminate (using hi tech glues) 2 or more pieces of glass together. This is the most common method of cold glass working. A few artists actually start with a piece of solid glass and sculpt it into its final form using sandblasting, diamond saw cutting and hand tool cutting. Some of the best know glass artists using cold glass techniques are Sidney Hutter, Jon Kuhn, Christopher Ries and Martin Rosol. ARCHITECTURAL GLASS: Simply stated, architectural glass is any method or style of glass art used in large scale architectural installations. 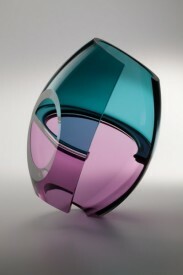 Although the use of cold glass techniques such as laminating sheets or blocks of glass together ( Sidney Hutter and Jon Kuhn come to mind) is sometimes referred to as architectural glass, this category can also include large scale blown glass installations ( Dale Chihuly and Lino Tagliapietra would be examples here). Other glass artists who sometimes do large scale architectural glass installations are David Bennett, Martin Blank, Dan Dailey, Debora Moore and Ginny Ruffner. SLUMPED GLASS: Slumped glass refers to the technique of taking one or more pieces of glass and heating them to a molten state in which they can be slumped over a mold or in a free form shape. Mary Van Cline is one well known glass artist who employs the slumping technique. FLAMEWORK OR LAMPWORK: The flamework or lampwork technique is somewhat similar to the slumped glass technique. It involves heating two or more elements of glass (often glass canes or rods) and fusing them together and often also involves twisting, pushing or pulling the fused glass into a particular shape. The best known artists using this lampwork technique are Paul Stankard and Ginny Ruffner. COMBINED GLASS TECHNIQUES: A glass artist is not limited to a single technique. As an example, many artists combine glassblowing with furnace work, first blowing one or more bubbles of glass and then shaping the glass sculpture into a particular form. William Morris and Karen Willenbrink are excellent examples of this combination of techniques. An artist might also combine glass casting and glass coldwork, first casting a glass piece and then cutting into it to add texture to the surface. Steven Weinberg is a good examples of this combination. Lino Tagliapietra often uses coldwork on the surface of his blown glass sculptures in order to create different types of surface engraving. MIXED MEDIA: Glass can be combined with many other materials in the creation of glass artworks. Ginny Ruffner often combines glass and bronze. David Bennett blows glass into a metal framework. Alex Bernstein laminates cast glass to steel. Less frequently glass has been combined with wood, stone, clay and other materials.